Hello all! 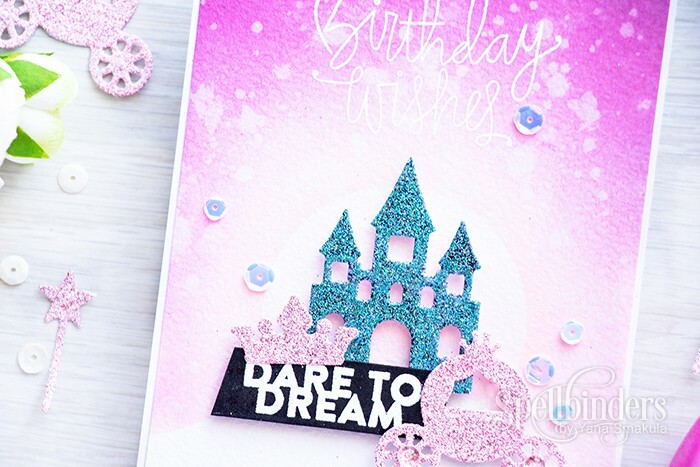 Occasionally I love to add a bit of glitter to my projects, especially create glitter die cuts to help my cards pop. 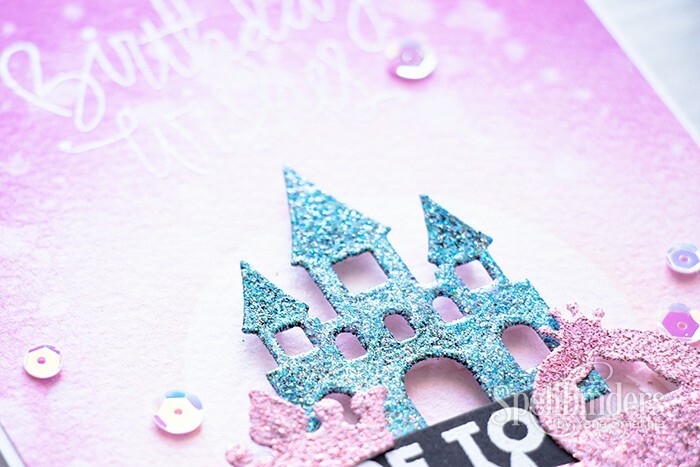 I have found that different glitter papers die cut differently, and those that are easy to die cut usually shed glitter and those that don’t – wont die cut at all. So my solution for cases like this is my make my own glitter paper with the help of glitter embossing powders. I die cut all of the shapes from the Pretty Princess die set from Spellbinders out of white cardstock, covered each using clear sticky embossing ink. I prefer to use Stampendous Emboss Gloss for this as it comes in a bottle with a sponge applicator and is easy to apply, however embossing ink pad or ever an ink pen can also be used. Next I poured glitter embossing powder and heat set it with my heat tool. For the castle I used WOW Vintage Peacock Glitter Embossing Powder (here’s another project using this powder on black) and for the carriage, crown and magic wand I used Zing Pink Glitter Embossing Powder. I heat embossed each shape with two layers for a fuller coverage, these can be embossed 3 times if needed, I find one layer to be not enough. 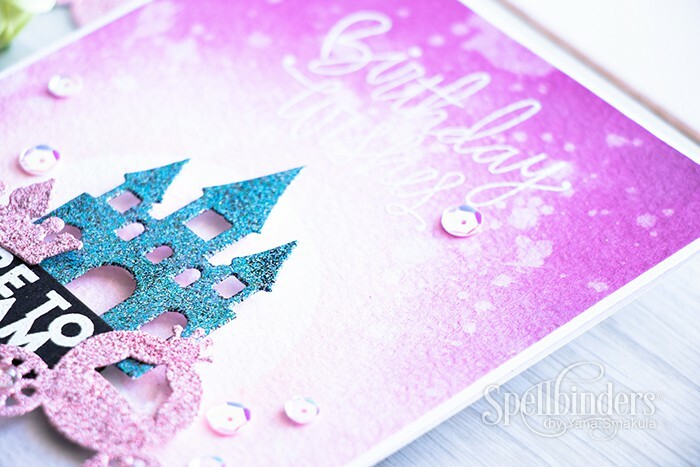 The trick to keeping your work space glitter free when working with these type of embossing powders is embossing the shape from behind, from the back, this prevents loose glitter particles from flying all over the place. You can also first emboss your paper and than die cut it, however I prefer to do it vice versa, this way I can also emboss the sides of the die cut, see the castle below – you can’t see any white there. I used a few more dies to create this project even though you can’t really see them here. I used a circle and a curved border die to create masks and apply ink to the background to create a fairy-tale type sky. I used several colors of Distress ink and added lots of small drops of water in the end to make it look a bit more realistic. 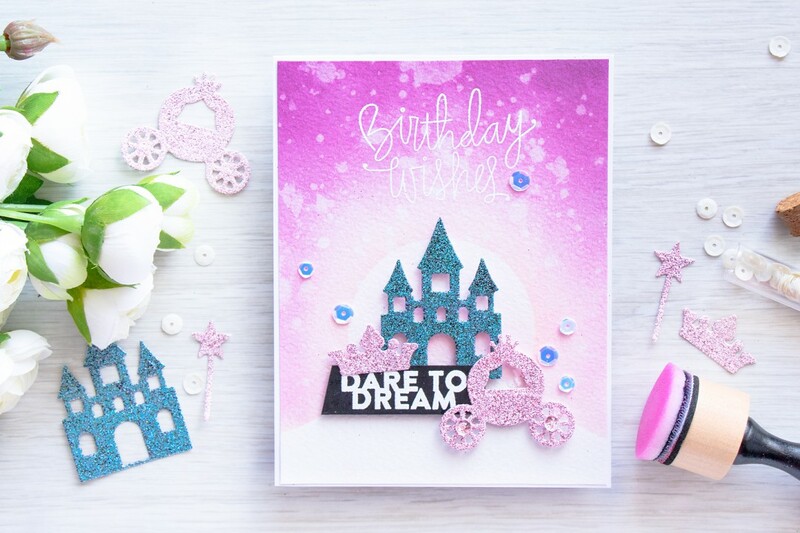 I made this into a Birthday Card, but also added a Dare to Dream sentiment which makes it a good card for a girl of any age as, I’m sure you’ll agree, its never too late to dream. This card is magical! Beautiful piece of Wonderland! Awww Yana, this is so sweet! I love your technique, it gives us a lot of options if we don’t have the glitter paper. Also I don’t know if the glitter paper harms the dies. Yana your card is adorable. Thank you for showing how you got this look. I like glitter for some things but hate that the card is always shedding bits of glitter. I can’t wait to try this out. 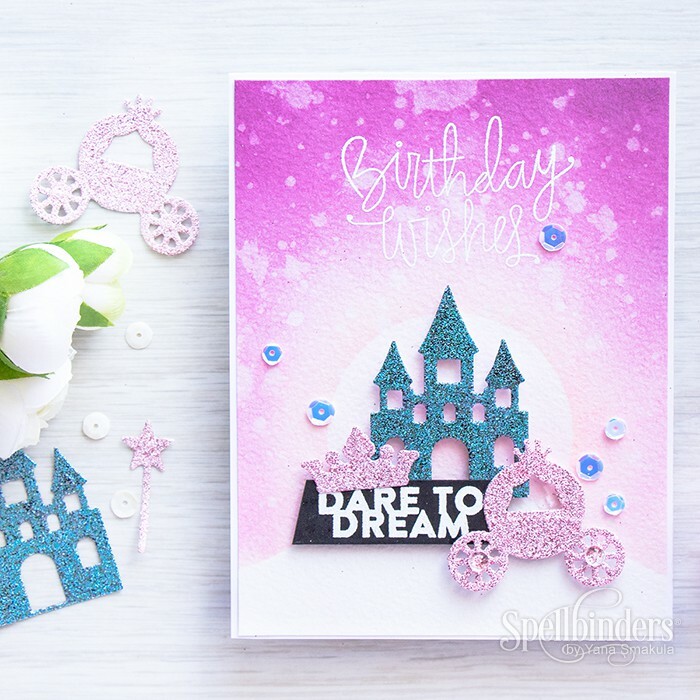 Lovely and full of magic – any little (or big) girl will be delighted to receive this beauty 🙂 Thank you for a fab video too! Another beautiful card, as are all your cards. thr glitter is wonderful. I do have a couple quick question, the addition of “Birthday Wishes”, is that a stamp or die? If a stamp, did u stamp in white or emboss in white? One last thing, who makes the Burthday Wishes? Thanks again for another wonderful card & the great techniques.